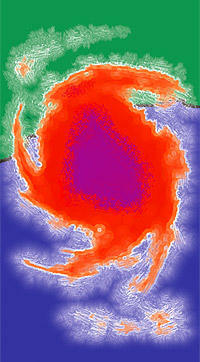 Home » Archive » Topics » Facility Management » Hurricane Rita: will the same mistakes be made twice? Hurricane Rita: will the same mistakes be made twice? Meteorologists explain the randomness of hurricane targets: just because an area was hit once doesn’t make it any less (or more) vulnerable to future strikes of lesser, equal, or greater magnitude. Florida experienced this phenomenon last year with three major storms in rapid succession; right now, the Gulf Coast states are hunkering down to prepare for the same thing at this very moment. While the movement of storms is relentless and random, response and preparation can be managed and controlled. The question remains: have first responders learned anything in the aftermath of Katrina now that Rita is bearing down? Let’s all cross our fingers and hope for anything but a repeat performance. Once again, facility managers anywhere within Rita’s striking range are urged to read TFM‘s August article by Bill Begal entitled, “Surviving A Rough Hurricane Season.” Begal will be providing follow up coverage including his personal account of Katrina damage in an upcoming issue of the magazine.